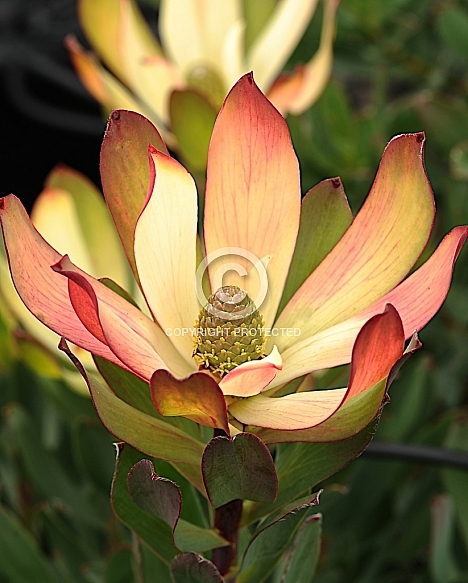 Description: Leucadendron ‘Sixteen Candles’ (L. discolor x L. salignum) An Australian-raised hybrid forming a compact, bushy shrub of 1.5 m (5 ft) this cultivar is at its best in late winter when it flares open to expose the cream inner bract colour and the central female cone. At this stage it is a long-lasting and lovely cut flower for picking purposes. Earlier, at the more closed stage, the bracts still have excellent picking potential, but lack the colour contrast of the later, more open bracts. A hardy, easily grown cultivar, ‘Sixteen Candles’ is a useful size for the home garden and is reliable and frost hardy in most districts.